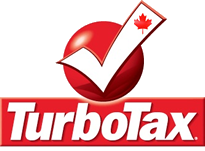 Get 52% OFF Save 52% on TurboTax Standard, Canadian Version. Now get the 2012 online version of TurboTax Standard Canada now for just $32.99, about 52% off the boxed version which retails for $69.99. The online version is sold exclusively at intuit.ca, has all the same features as the boxed version, and lets you work on your taxes from just about any internet connected computer or iPad. On Sale! 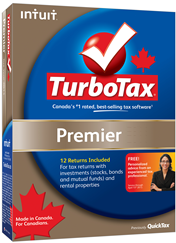 Find TurboTax Premier 2012 on sale at Amazon Canada. Amazon.ca now carries all of the latest TurboTax software, including select versions of TurboTax Premier 2012 Canada on sale for up to 10% off with free shipping. Because it’s Amazon, you don’t need any additional promo codes or coupons to get a great deal as the listed sale price is the best deal. Offers tend to change daily so see site for more information. Import of selected financial and tax information that is entered automatically in the appropriate fields (tax information can be imported from TurboTax, UFile, or H&R Block). Audit Risk Alert – once you enter current year’s information, the software searches for potential red flags that can trigger a CRA audit and lists them for your review. Support Center via chat, email or phone; to learn more about taxes access Live Community that discusses many tax related topics and offers solutions to individual problems. Option to file your return electronically with CRA via NETFILE; if you owe money, you can make electronic payments as well using My Payment. Maximize your pension income with Pension Income Splitting Optimizer. Aside with the features already mentioned, TurboTax Premier’s additional focus lies in helping you account for investments and income from a rental property. It will calculate cost basis for your proceeds from stocks, bonds, mutual funds, or employee stock plans. If you are actively planning and contributing to your retirement, there is a RRSP calculator that serves as a great planning tool. With a slider, decide whether to contribute more or less in the coming year and see the immediate impact on your refund. Whether it goes up or down, you are in better control of your financial future. Finally, if you supplement your earnings with rental property income, Premiere has the entire section dedicated to handle it. This isn’t only about entering income earned and expenses related to it, but also any improvements and repairs done to the property. With that, the software looks for all deductions you may qualify for and gives you ideas on getting the maximum benefit out of the property. See all our TurboTax CA Deals! Before you get TurboTax, see the discounts now available on Canadian editions of H&R Block tax software.